Who is that mystery photobomber in the background? 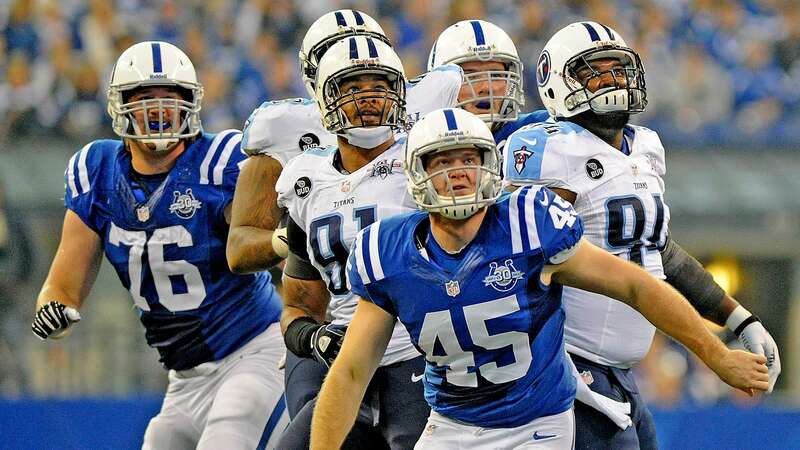 Best coordinated watching of a field goal: Tennessee Titans and Indianapolis Colts. It’s a moment frozen in time. All of these fine gentlemen transfixed by Adam Vinatieri’s field-goal attempt. Did it go through the uprights? Who cares? 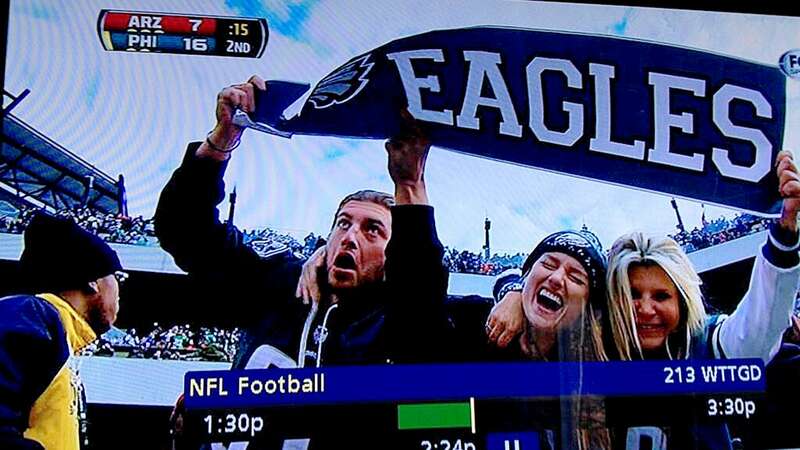 Best reaction to ripping a homemade Eagles banner: This guy. All that effort just down the drain with one accidental swipe. Oh, the humanity. Worst job of holding on to the football: Arizona Cardinals. First, the Red Birds botched a punt return, but Antoine Cason picked it up and ran for some nice yardage before coughing it up and allowing the Eagles to recover. I don’t care what level you’re at, that’s just bad footy. What’s footy? Apparently, that’s the Australian term for "football." I just learned that today. Best insightful tweet that’s almost … confusing: Isaiah Pead, St. Louis Rams: The young running back hasn’t played much this season, but that doesn’t mean he’s not giving us gold in other ways. 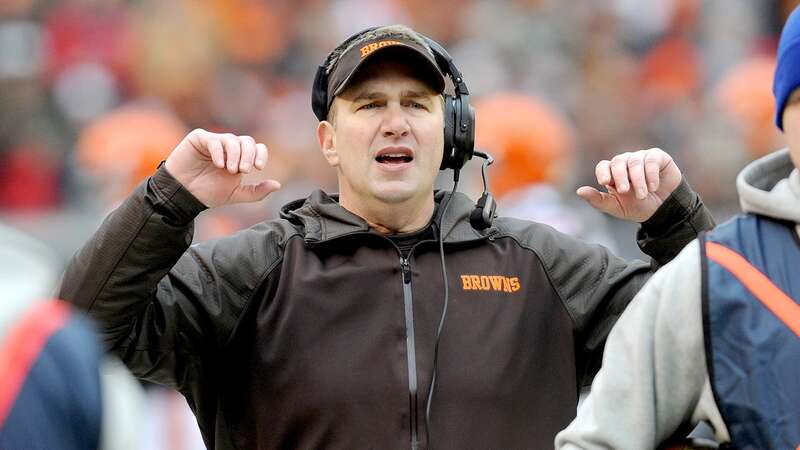 Most accurate reaction to losing to the Jaguars: Rob Chudzinski, Cleveland Browns. That’s right, coach. Your team took a header at home to a bad team. There really isn’t much else to say. 'Football will always pay you back.."
Best photobomb of the season: Evan Mathis, Philadelphia Eagles. 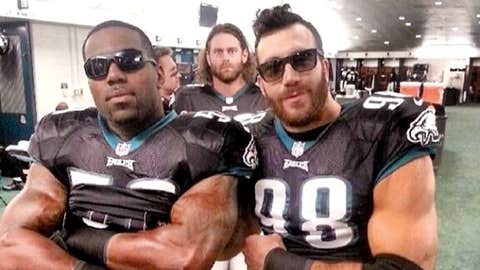 Linebackers Trent Cole and Connor Barwin are just trying to have some fun and pose for a photo. Then there’s Mathis, giving us chills with a killer look in the background. Epic. Worst fashion statement of the week: This Jets fan. Look, I’m no Timothy Gunn (who is, really? ), but I take issue with this. I say if you’re going to mark up your body, take some time and come up with something clever. 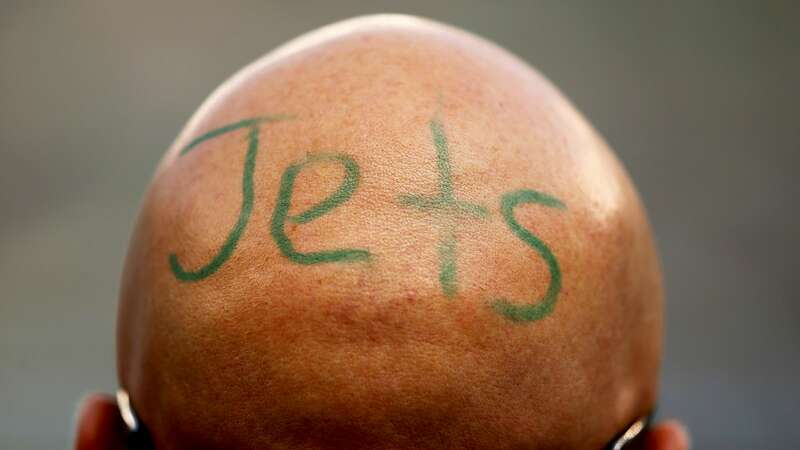 Don’t just have someone sloppily scrawl "Jets" with a Crayola marker on the back of your dome. Faux pas, faux pas. Best "we hear you, bro" tweet of the week: Leonard Hankerson, Washington Redskins. The wide receiver is out for the season with a knee injury and he’s understandably frustrated. It’s hard to be laid up and watch football on TV when that’s what you do for a living. 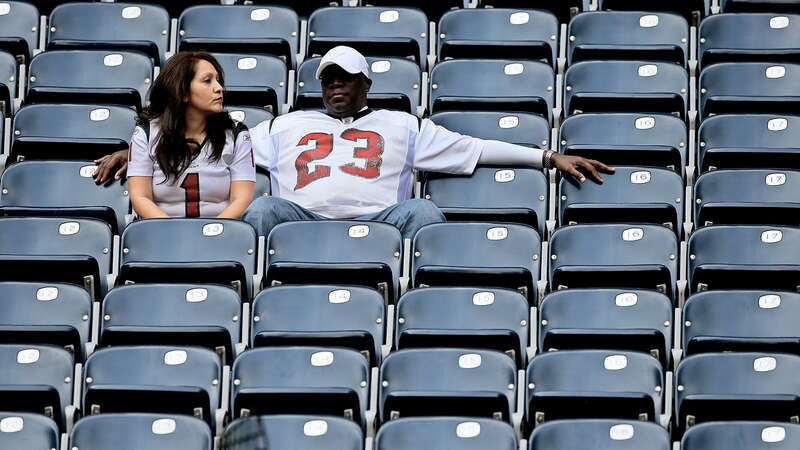 Saddest Texans fans of this current week: These two. By the way, this shot was taken after the game. So, this pair watched the Texans lose their 10th straight and decided to hang out for a little while and just bask in the failure? Strange. Best job of crawling after a first down in a critical AFC West matchup: Knowshon Moreno, Denver Broncos. The running back cried rivers of tears during the national anthem and then followed that up by crawling and gesturing late in the game against the Chiefs. Hmmm, ok. Let’s move on! Best photo with a controversial Toronto mayor: This guy with Rob Ford. 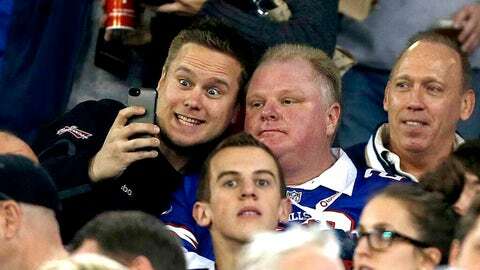 The embattled mayor of the city showed up to watch the Bills take on the Falcons in Toronto on Sunday. This guy couldn’t have been more excited. And Ford looks … less than thrilled. Outstanding.